The physical size, depth, volume, and cable management of the 5 Square Telecom Box provides for minimum bend radius requirements, per cable manufacturers, for today and tomorrow’s high speed copper and optical fiber cables. Proper designing of pathways and spaces insures cable and connecting hardware functionality. Historically, infringement of cable bend radii was not an issue, but due to current and future transmission rate increases, bend radius observance is now very critical. The 5 Square Telecom Box supports categories 5e, 6, Augmented 6, 7, Augmented 7, and optical fiber cables as well as expected future generations of cable sizes. Integrated cable management forces technicians to place the cables around the outer perimeter of the cable management posts, thereby preventing kinked and over-bent cables ensuring proper data transmission. Easier and more uniform installation between technicians - reduces installation variation. Once installed in the wall, the 5 Square provides for quick and easy cable upgrades without the need to open walls to replace old technology 4 square and 4-11 boxes that are not intended for today’s cable sizes and bend requirements. The 5 Square’s size allows for recommended slack cable per BICSI in the box. This is not possible in 4 square and 4-11 boxes. 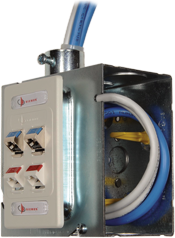 The 5 Square cost savings impact is that it eliminates the need for a second technician in a remote location, such as a ceiling or closet, to assist pushing/pulling cables back up the conduit after termination of connectors. Likewise, future maintenance and repair is much quicker, easier, and cost-effective with the 5 Square Boxes with slack cable due to it being a one man operation. A smaller box without slack cable requires two technicians even for maintenance and repair. The ability to work at the 5 Square Boxes with only one technician is extremely valuable on all projects. We’re all aware of general contractors’ frustration with technicians lifting ceiling tiles after initial placement due to the frequency of damage to those tiles and debris deposited on the floor below. This situation becomes even more critical in health care facilities when opening ceilings is either completely prohibited or greatly discouraged because of the potential spread of bacteria. Life of your Facility with the 5 Square® Products! Thank you for choosing RANDL Industries, Inc.